So who rocked the red carpet? Newly-minted Emmy winner Tiffany—she nabbed one last weekend at the Creative Arts Emmys, for hosting Saturday Night Live—didn't have the will-she-or-won't-she pressure on her tonight, so she could let loose and celebrate. This dress is the most delightful way we can imagine for her to do it. She's a human rainbow, and hopefully her pot of gold is waiting for her somewhere. 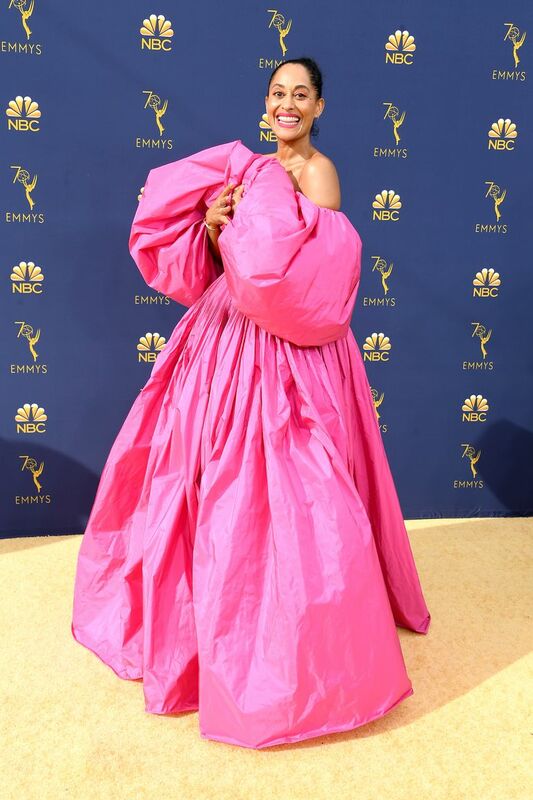 In half the red carpet photos, Tracee was trying to wrangle that enormous ruffle. Rolling around in Barbie's guest bedding for the night doesn't seem ENTIRELY worth it if you can't get the crudite to your mouth quickly. Her heels are a normal, non-foot-snapping height! The dress pattern reminds us of the Frances books we read when we were little—and that's a compliment! Can it be that someone finally looked at Millie Bobby Brown's IMDb page and realized she's still only 14? It's a miracle, and not a moment too soon. Bless Taraji for showing up to present—and saying the word "Empire" several times to Giuliana—in something this dramatically bright and bold. 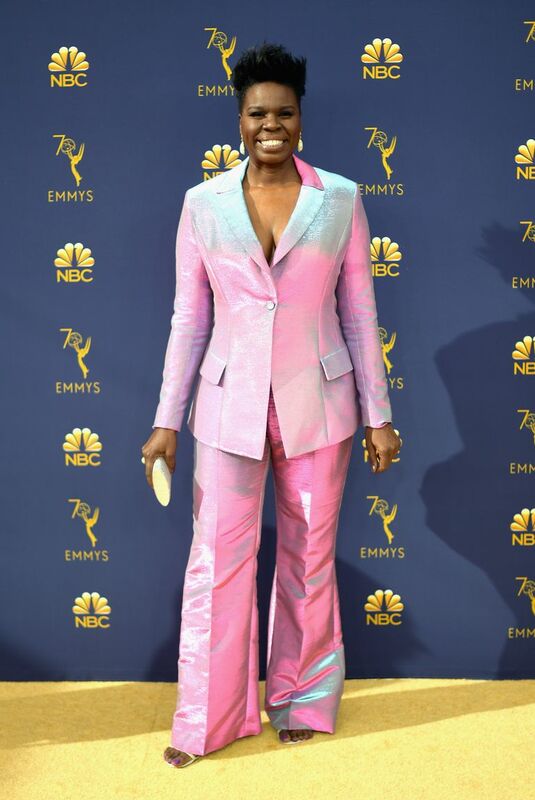 Leslie looks totally dynamic in this suit. Gone are the days when she had to go hunting for a designer who'll dress her; why on earth would you not? 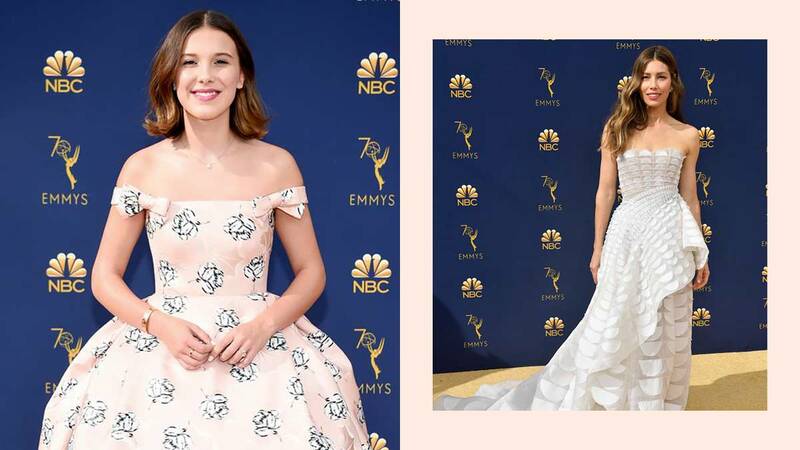 When she was shooting The Kissing Booth, there's no way Joey King could not have imagined being the toast of social media and at the Emmys in a gown that could give Taraji's a run for the most dramatic of the night. We haven't wanted to wear raspberry so badly since Prince sang about the beret. Allison is at her National Treasure finest in this. If we had a peerage system, we would demand a title for Allison Janney. She is so funny and dishy and smart, looks completely perfect in this goddess-like sheath, and no doubt can tell a raunchy story or three over a liquid lunch. That's our kind of dame, or Dame, for sure. Let's just be honest: This is glorious. It is a Gown with a capital G, a proper noun of a dress. Angela was one of the first people to hit the red carpet, and with good reason: This look deserved all the screen time it could get. In fairness, maybe this isn't technically a Dress Over Pants, as much as it is a Jumpsuit With a Train. Whatever it is, it's delicate and pretty and dreamy on her—as long as you don't start thinking about how the pants might be a little too long. Jessica Biel is beautiful and has popped up at many awards shows over the years, and she's looked very pretty at many of them. But "immaculately crisp and architecturally interesting" are not words we've ever used on her before, making this one of her very best efforts. And that's not even getting into her moral victory of being able to speak at length to Giuliana on the pre-show without Justin Timberlake interrupting. She lost her category but she's still a winner for that alone. We haven't had as many red carpet moments from Packham in recent years, and her London Fashion Week presentation was painfully small for those of us who love her aesthetic. Enter Samira Wiley, who gave us our fix in this bit of silver perfection. She took home Best Guest Actress in a Drama for her role in The Handmaid's Tale at the Creative Arts Emmys last week, and we applaud her for picking something as gleaming as the hardware she has for her mantel. This is divine. Keri Russell is divinely talented and tremendously chic, and we are sad she came to the Emmys in support of The Americans in a dress that seems to have molted in the limo on the way over. 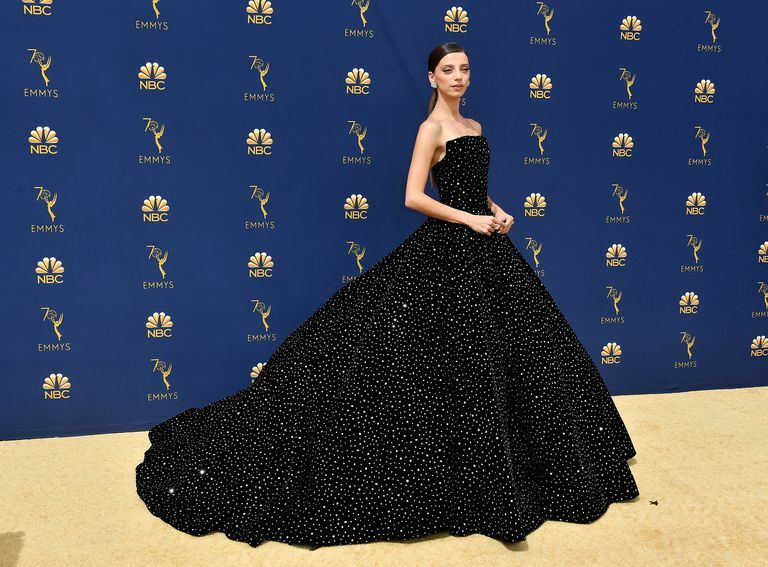 Is there any better way to celebrate being in a groundbreaking smash-hit summer movie than being one of the best dressed at the Emmys? Well, possibly; we'd take ourselves on an exceptional vacation, and go on a shopping spree at Harry Winston. But this certainly isn't the worst way to go. We only want excellence for Chrissy, and unfortunately, this does not qualify—although it does have an '80s nighttime soap realness to it that we need to salute in theory, if not in practice. 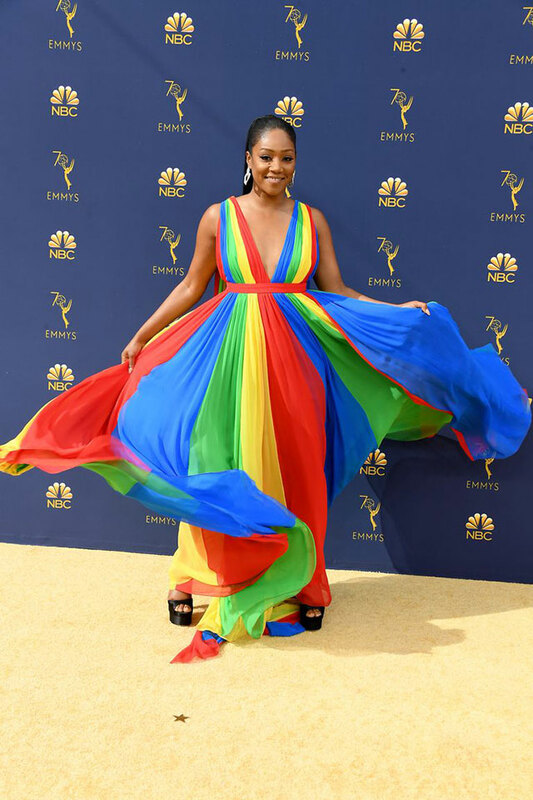 You could argue that her scarf is a bridge too far—there are some shots of this dress where it looks like a ginormous sleeve—but we're too tickled by the color to raise any objections. Jenifer, a hoot on Black-ish, is anything but goofing off with this ensemble. 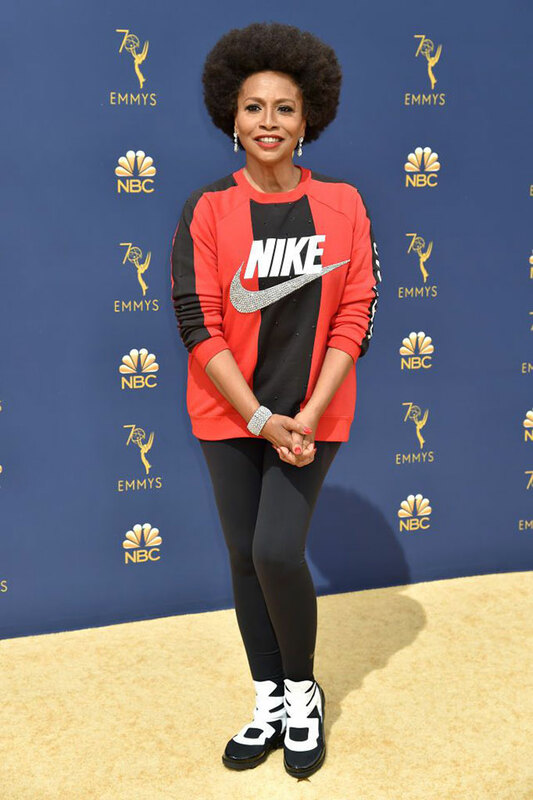 She wore Nike specifically to honor the brand for supporting Colin Kaepernick, the teamless NFL quarterback who kneeled during the national anthem to protest police brutality against black people—a topic her show set out to cover until ABC scrapped the episode. "Thank you, Colin. Thank you for all that you do. Thank you for being brave. Thank you for being courageous. Thank you for taking a knee," she said, later adding, "We need more corporate America to stand up also." Well played.